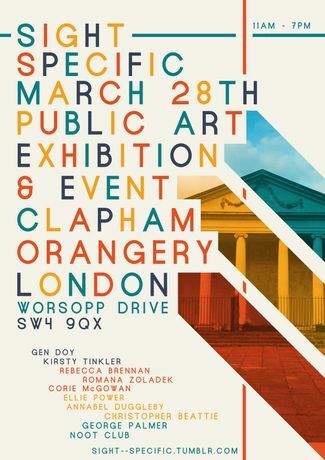 A site-specific exhibition held at Clapham’s derelict Orangery, featuring works that respond to the architecture and the original purpose of the portico. The exhibition will feature a range of work, from sculpture and installation to performance and video works, all responding to the unique structure of the derelict orangery hidden along Worsopp Drive. Current artists include Kirsty Tinkler, Noot.Club, Rebecca Brennan, Gen Doy, Annabel Duggleby, Ellie Power, and Christopher Beattie. The free, one day event aims to pioneer the rejuvenation of the currently unused, historical site, as well as innovate creativity, and bring a new atmosphere to the building and its surroundings. Some of the pieces will be left there on display for the week after the event.